New Zealand is such an unlikely place to spawn such an eclectic assemblage of post-punk pioneers, guitar abusers and folks with an innate knack for melancholy, chiming indie-pop masterpieces. However, I guess that the age of the internet has taught us dullards that the musical universe never revolved around the United States and England and that every nation harbored a cabal of unheralded geniuses, eccentric weirdos and impeccable tunesmiths. Most of us were just ignorant to its existence due to a lack of distribution or a fixation upon the effortlessly familiar. New Zealand was an exception to this rule since many of its flagship acts like the Clean, Chills, the Bats, Cakekitchen and Tall Dwarfs signed distribution deals with North American labels during the 80s. Therefore, folks took notice and dug deeper into its furrows to find that there was more than rainy-day reveries up its collective sleeve. Although I adore the aforementioned bands in a particularly unhealthy way, there was something about the more damaged sounds of 80s and 90s New Zealand that resonated with me in a way that still moves me in a kind of transcendent way. Folks like Peter Jefferies and Alastair Galbraith and and bands like This Kind of Punishment, Dadamah, Dead C, Gate, Plagal Grind and the Terminals mined a dark, brooding space peppered with fragile ballads that literally seemed to walk on eggshells as they teetered between nihilism and a skewed sense of melody. Most of these bands found a safe haven on the Xpressway label and forged a totally idiosyncratic sound unlike anything else I’ve heard since its collapse. I had given up the ghost long ago and surrendered to the fact that no one would resuscitate its vibe until I heard Pumice, a one man operation led by Stefan Neville. To be honest, I think this album is probably better than anything ever released on Xpressway and that folks will revisit it years from now and finally give it its due. By no means is it an easy listen. Its seams and flaws are fully on display and it only grips the listener after many late night strolls with it as your sole companion. Pebbles is a schizophrenic listen that teases you with ecstatic riffs and a joyous spirit in the first two minutes only to drag you down into “Bold/Old”, a fragile meditation on the woes of life set to a woozy background of hazy, psychedelic guitar meanderings, distant piano plunkings, and the buzz of gentle hiss. You can’t understand a lick of what he mumbles, but it somehow reminds you of moments when life felt like a perpetual string of potholes until he lets loose a triumphant warbling that reminds you that smoother sailing awaits even the most troubled souls. There is such beauty amidst the gentle feedback, drones and deceptively ramshackle arrangements. “Spike/Spear” goes on for eleven minutes, but its droning, moaning and surging peaks coalesce into a true centerpiece for the album. It’s like a palate cleanser that wipes the slate clean with a long pause where you can empty your mind and get lost in the swirl of sound before embarking on a second half that is much harsher than the first. We get a short respite before he tears into “The Only Doosh Worth Giving”which conjures the spectre of the Clean’s “Point That Thing Somewhere Else” with a more punky, nihilistic streak. It shreds in a way alien to this planet. The rest is either haunting, sparse and mood destroying or swells and peaks of noise that are best suited for headphones and a grand tolerance for volume. Pebbles ain’t for everyone, but it sure feels like it speaks to me each and every time it flops onto my turntable. It may be sweltering here in Philadelphia, but I’m an organized soul who likes to get a head start on the next season, especially when it’s autumn, my favorite time of the year. Throughout the years, there are only a handful of bands who somehow capture my admittedly biased view of that time where life slows down and the leaves take their sweet old time on their way from the treetops to the concrete below them. Yes, summer is a time for exploration and adventure down country back roads and travels to farflung locales, but autumn is when you take your sweet time and patiently watch another year come to close and reassess your priorities for next year while taking inventory of the present one. It’s a time for meditation and speculation about what went right and what went terribly wrong before another year gets brutally latched upon your sum total. 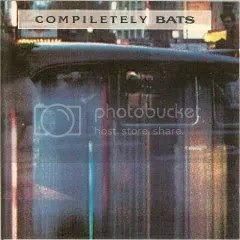 For some reason, the Bats, along with fellow Kiwis, the Chills, Verlaines, Magick Heads and Peter Jefferies capture this sense of ennui so perfectly that I start listening to them in earnest a couple months before they are best suited to my mood. Then again, I am an impatient soul, so it is only fitting that I pay tribute to autumn in August. On the surface, Compiletely Bats, a collection of their first three eps, is an odd choice to associate with autumn, but they are forever intertwined with it because their songs are so optimistic on the surface, but scratch a little deeper and you see swaths of melancholy, self-doubt and introspection. In short, these are the the qualities that I associate with a time where the party slowly comes to a close and you are left questioning and applauding the past while generating a plan for the murky future. The best example of this can be found in the opener “Made Up in Blue” which may be the apex of New Zealand pop, but the lyrics paint such a contradictory image to the chipper strums and jangles. It’s an ode to indecision and worry as its protagonist questions his social circle, direction and the advice of others as he bemoans the dead weight that surrounds him. It sums up that moment when you doubt a big decision, ponder the consequences and benefits and take a leap into the new. In between are tales of faded glory, grasping at straws and tragic nostalgia, all of which highlight their focus on the grey and beige in our lives, but its closing number provided a perfect bookend to it superficially sunny opener. “Offside” closes out the compilation on a pitch perfect note as it eloquently depicts the onset of winter and its resultant stagnation. It details a fight against depression when your friends are hibernating, trees are bare and optimism is a rare commodity as vocalist Robert Scott embraces the bottom of the barrel only to discover that there is nothing there but darkness. Instead of wallowing in woe, Scott decides that the best path is introspection and meditation and he ultimately he decides the best path is a long walk where he embraces the scenery and decides that innocence and new beginnings are just around the corner. Just like most Bats songs, it sums up the moment before you hit rock bottom when you realize things aren’t quite so bad as your neurotic mind makes them out to be. That’s why the Bats embody autumn. Their songs are about scenes of darkness and despair where the storm clouds break and meager rays of sunlight break through the murk and provide hope in barren times. I’ve been pondering the posting of lists. This will be the first in a series of thematic collections relating to floats my boat. Today’s list was inspired by a humid drive into the barren heart of Delaware County where Peter Jefferies’ depressing Electricity album placed me in one of those pensive moods that went perfectly with the blur of chain restaurants dominating my horizons. Therefore, this led to this list of songs that always make me feel like a maudlin chump. Sorry that these are individual tracks, but I broke it up so you may pick and choose. There will probably be a sequel since I gave up at twenty. -he sounds broken down before his life even began. There are many worthy choices on this album, but this captures the weight of love gone wrong. -he has devoted so much time to being the most wiggity-wack Scientologist in the club that you forget how great he can be without the fixins’. A vivid snapshot of regret, lost friendships and the worry that goes along with new beginnings. -a soft-rock classic where the protagonist is pitiful and pissed at the same time. Who knew Bread had such issues with passive aggressive behavior? -I could probably pick any of their songs, but this one crushes you more than the others. An old chestnut that deals with those times you miss the company of other humans. -Oh Gary, lemme give you a big old hug. Nevermind, let’s finish the bottle. -an exploration of powerlessness, then hope. Actually, this is kind of uplifting in its own way. -A man willing to do anything to regain the past. Kind of romantic, but tragic. -Sad only because its Vietnam era warnings seem relevant again. -I always imagined this to be about Mark Olson’s worries about his wife’s struggle with Multiple Sclerosis. -I don’t know what the hell she’s talking about, but it seems to deal with her struggles with mental illness and her pleas for a lover to assist her. 13. Lisa Gerrard-“Sanvean” from Live in Dusseldorf bootleg. -I hope these are the sounds I hear as my life enters its last minutes. -A song about drowning from a side project of Robert Scott of The Bats. -another tale of lost love and the attempts to regain it. -a man discovers that travel and booze won’t solve his problems. Go figure. – my favorite song at the moment. A heart-wrenching three minutes. -somebody not only broke this dude’s heart, but squashed it into a pulp. -This is a close second to the John Cale song in terms of crushing hopelessness. A song about a man who has been isolated so long that he’s forgotten how to relate to humanity. -let’s end on a wordless note. His cover of Albert Ayler’s “Saints” is a dark, moody end to this self-indulgence.